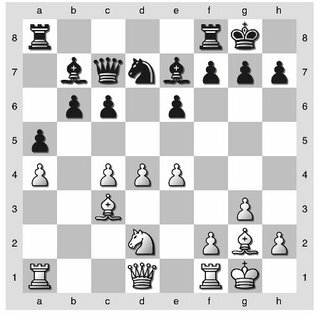 After reading through Chess Praxis by Nimzowitsch, I found it easy to convince myself that his favored crooked openings, like the Dutch, Reti, or for that matter the Nimzo-Indian Defence are the most dominant openings known to man. 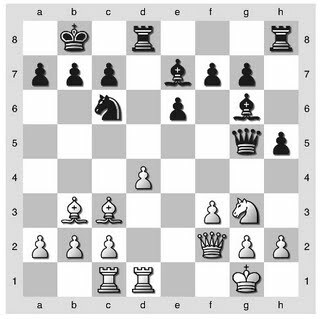 Even more irregular openings he would play he would occasionally acknowledge as being slightly dubious, but encouraged the reader to believe that correct chess could be found on a wide road rather than a narrow path. The closer to the edge of that wide road you go, the more cliffs and ravines might threaten your every missed step, but the more beautiful the journey would be (paraphrasing from memory). This got me to thinking - is there a skill level at which mainline openings are truly needed, and is any of us likely to reach it? Our own NM Mark Kernighan plays sensible openings but will play second- or third-best variations for the sake of variety or to avoid book opening traps, knowing that the middlegame is his proprietary venue. 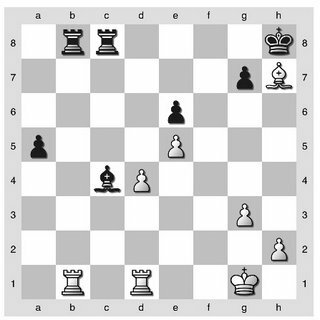 Class A players I have played seem to have made up their own openings out of whole cloth - perhaps they are dubious, but how to prove it in a quick game? How many moves have I memorized that are just the latest refinement in a long series of refinements on an opening when what actually determines the winner of my games is being the person who doesn't drop a piece? So play your Grob's, your Fried Liver attack and your Cochrane Gambit. In a game between us amateurs, the road is wide indeed, and the view occasionally breathtaking. In the position below (G/30) I had been suffering for awhile so I was glad for the opportunity to break out with 1. d5!? In the following diagram, is White justified in pushing d4-d5, or is more preparation needed, or is another plan more appropriate? Parimarjan Negi stifles our yawns and brings it home for White. I'm glancing at computer analysis while writing this, but nothing dramatic is going on. White is simply better. 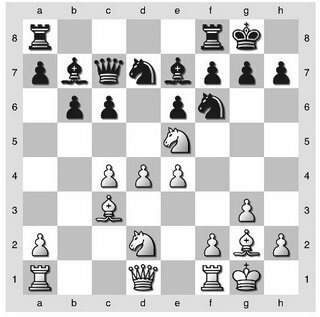 Compare this diagram to the last and you can see the consequences of poor pawn exchanges - White has several comparable ways to increase the pressure while Black can only hope to exchange pieces and free his game. 14. NxN?! (Black is one pair of pieces closer to equality) NxN 15. a4 (searching for a new weakness on b6) a5!? as much as ...e5! which it claims leads to equality. 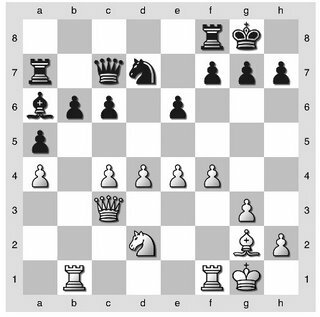 Very non-intuitive for me, but in essence White does not gain from trying to create a passed pawn with 16. d5 because Black is not obliged to exchange but can simply blockade. While ...a5 may not be the best, I did a rough calculation and convinced myself White could not win the b6 pawn. 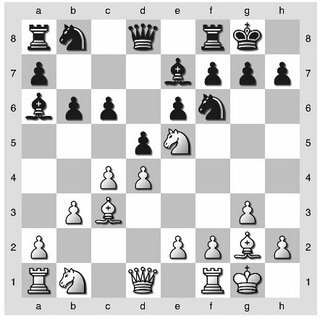 This could be true, although a deeper look may question whether defending the b6 pawn should expose me to attacks on the kingside because of White's mobility advantage. 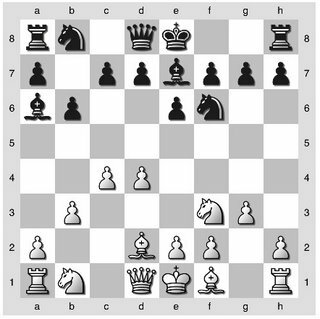 Isn't chess complicated? 16. Rb1 Ra7 17. f4 Bb4!? I was surprised my opponent let me exchange another pair of pieces...and yet I may have been better to keep the bishop, as my dark square weaknesses became a problem. 22. e5! Now d6 is perilously weak, a perfect destination for the White knight (which incidentally is threatening a fork of my rooks). Oh, for a dark squared bishop. 22...Rb7 23. Ne4 Rd8 24. 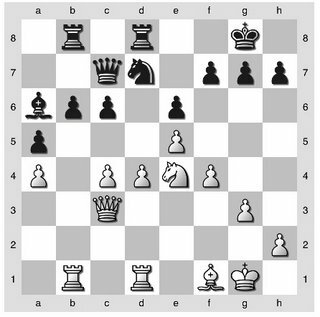 Rd1 White's advantage has become concrete - I felt my only chance would be to somehow induce a knight exchange on d6 by the circuit Nd7-f8-g6-e7-c8. Remarkably, my opponent fell into this, and only this let me survive. 24....Nf8 (the journey begins) 25. Nd6 Ng6 26. Bd3 Ne7 27. Be4 Nc8 28. NxN? back into contention, and another pair of pieces is off. An endgame has arisen that only White can truly hope to win. However, doing so will not necessarily be easy with his extra pawn being backward and Black having an outside passer. Despite the fact that the teams were tied, I think my opponent was a bit disappointed and exhausted, the game now being 4 hours old. I think if he were better rested he would have found a way to squeeze me and improve has advantage to decisive proportions. As it was, I was proud of myself for holding up under the drawn out pressure of this game, which gave me hope that better games were to come.